England's openers got off to a good start against the West Indies, both Michael Lumb and Craig Kieswetter hitting the West Indies bowlers to all corners of the ground. Lumb set the ball rolling in the second over of the innings, hitting Ravi Rampaul for a couple of boundaries. He then latched onto a short delivery from Sulieman Benn and dispatched it for four, as England raced to 30 runs in just three overs. 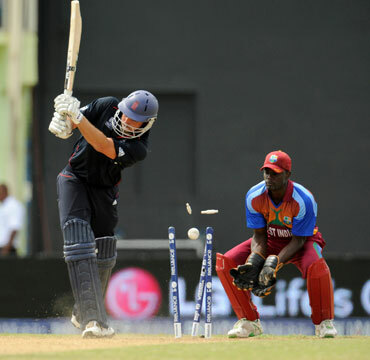 However, Chris Gayle gave the hosts the breakthrough when he cleaned up Lumb for a breezy 28 of 18 balls with four fours. 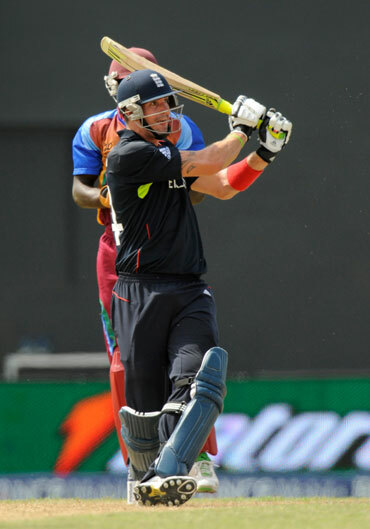 Kevin Pietersen then joined Craig Kieswetter and added 30 runs for the second wicket. Kieswetter was impressive in his brief stay at the crease. He first opened his shoulders against Nikita Miller and repeated the stroke of Rampaul off the very next over. However, Miller had his man, when he had him caught right in front of the wicket for 26 off just 14 balls. 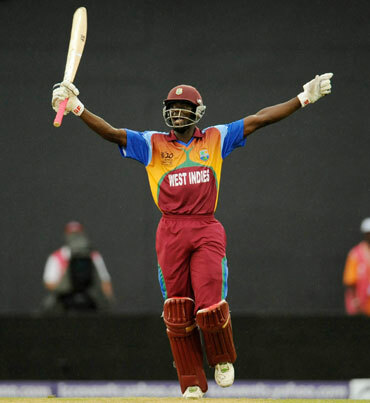 Last match hero, Darren Sammy then struck twice in one over to put England in a spot of bother. He first cleaned up Paul Collingwood and then had Pietersen caught in the deep by Ramnaresh Sarwan for 20. 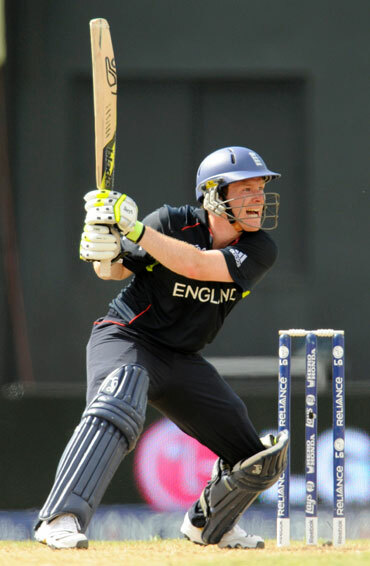 However a hard-hitting 95-run partnership between Eoin Morgan and Luke Wright boosted England to a commanding total. Wright started picking up the tempo, giving big Kieron Pollard a taste of his own medicine, hitting him twice out of the park. But it was the Rampaul over that provided England the impetuous; the bowler was smashed for three massive sixes and a boundary as 27 runs came off the 18th over. Morgan, at the other end, played an audacious reverse sweep, sending Benn's delivery towards the boundary as the southpaw soon brought his well deserved half-century. Morgan was finally got out, trying to increase the run rate off Dwayne Bravo as England finished with a challenging 191 for five wickets. However, just like the previous match between Sri Lanka and Zimbabwe, rain intruppted the play and played spoilsport. Chasing 192 to win, West Indies were 30 for no loss in 2.2 overs when heavy downpour started. Captain Chris Gayle and Shivnarine Chanderpaul gave them a good start. When the play resumed after over an hour, the Duckworth-Lewis method was applied and the West Indies were given a revised victory target of 30 in six overs. Requiring 30 runs from 3.2 overs after resumption, West Indies lost Gayle, and Pollard also departed without scoring anything -- Graeme Swann scalped both. However, Chanderpaul kept his cool and along with and Andre Fletcher the hosts knocked off the runs with just one ball to spare. With the win, West Indies made it to the Super Eight stage. The winner of England-Ireland match will be the other qualifier.